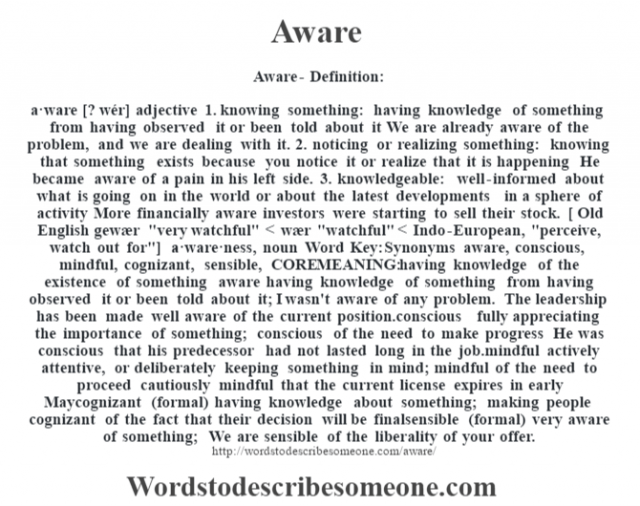 a·ware [? wér] adjective 1. knowing something: having knowledge of something from having observed it or been told about it We are already aware of the problem, and we are dealing with it. 2. noticing or realizing something: knowing that something exists because you notice it or realize that it is happening He became aware of a pain in his left side. 3. knowledgeable: well-informed about what is going on in the world or about the latest developments in a sphere of activity More financially aware investors were starting to sell their stock. [ Old English gewær “very watchful” < wær "watchful" < Indo-European, "perceive, watch out for"] -a·ware·ness, noun Word Key: Synonyms aware, conscious, mindful, cognizant, sensible, CORE MEANING: having knowledge of the existence of something aware having knowledge of something from having observed it or been told about it; I wasn't aware of any problem. The leadership has been made well aware of the current position.conscious fully appreciating the importance of something; conscious of the need to make progress He was conscious that his predecessor had not lasted long in the job.mindful actively attentive, or deliberately keeping something in mind; mindful of the need to proceed cautiously mindful that the current license expires in early Maycognizant (formal) having knowledge about something; making people cognizant of the fact that their decision will be finalsensible (formal) very aware of something; We are sensible of the liberality of your offer.